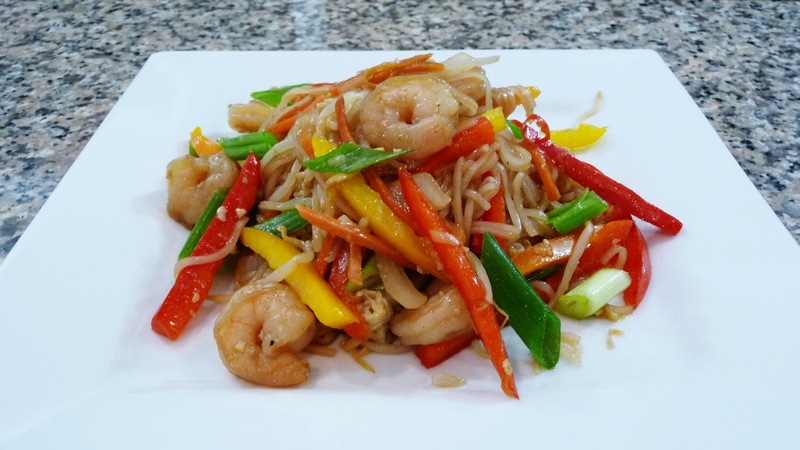 Today’s recipe is another of my Favorite Chinese dishes, Glass Noodles stir fry, I hope you give it a try! Season the shrimp with half a teaspoon of minced garlic and minced ginger, also add in one tablespoon of soy sauce and salt and ground white pepper. Marinate this for at least 10 minutes. Make the Sauce for the Stir fry: Combine the rest of the soy sauce with the Oyster sauce and the fish sauce, also add in two or three tablespoons of water or vegetable broth and season with a teaspoon of sugar and salt and ground white pepper to taste. Stir well and set aside until you are ready to use it. Cook the noodles according to the instructions on the package. Once they are cooked, rinse them with cold water and using kitchen scissors cut them a couple times so they will be easier to handle. Set them aside until you are ready to use them. Cook the Shrimp: In a wok, on high heat, heat up one tablespoon of vegetable oil, once the oil is hot, cook the shrimp for about three minutes or until it gets a pinkish color, once it turns pink, remove it from the wok and set it aside for a minute. In that same wok, in the leftover oil, cook the eggs, just scramble them, and when they are done, place them aside with the shrimp. Make the Stir Fry: In the same wok, heat up another tablespoon of vegetable oil, and stri fry the onion for one minute, just to soften it a bit. Then add in the minced garlic and the minced ginger, stir fry them for another 30 seconds, just so they will start releasing their flavor. After that, add in the carrots and cook them for another 30 seconds, then add in the bell peppers, and stir fry them for about two minutes or until they get your desired texture, I like my vegetables to stay crisp, so I only cook them for two minutes, but if you like them to be softer, feel free to cook them for about four minutes instead. Season the vegetables with a pinch of salt, just to add a bit of flavor. Once the vegetables are cooked, push them to the sides of the wok, to leave an empty space in the middle of the wok, and right in there in the empty space, add in the noodles and season them with the soy sauce mixture. Toss together so the noodles will be well covered with the sauce, and then toss the noodles with the rest of the vegetables. Once everything is combined, then add in the beansprouts, the shrimp, and the scrambled eggs, stir fry for a minute then add in the green onions, toss together, taste the flavor add more soy sauce if needed, and continue to stir fry for another minute or two, or until everything is well heated through.